Sometimes old-time recipes seem decidedly modern . A hundred-year-old recipe for Savory Potatoes is one of those times. This recipe reminded me of roasted potatoes that I sometimes get in restaurants. The Savory Potatoes were coated with a delightful, moist, onion and sage mixture which created an aromatic, savory taste sensation. I’m not sure whether it’s a plus or a negative, but my kitchen smelled like Thanksgiving when I made this recipe. The roasting potatoes smelled very similar to a roasting turkey stuffed with a traditional sage and onion dressing – though (thankfully) the actual dish did not remind me in the least of Thanksgiving. I assume that the 1550 calories listed in the recipe refers to the total number of calories for this dish. There’s no way that a single serving could have that many calories. Preheat oven to 400° F. Put the water, olive oil, sage, salt and paper in a mixing bow; stir to combine. Add the chopped onions, and stir. Then add the potatoes and gently toss until coated. 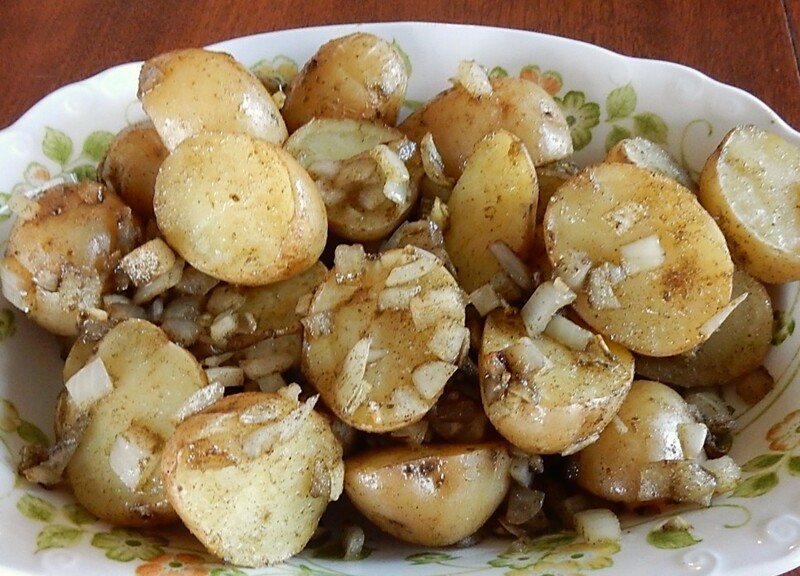 Arrange the potatoes in a single layer in a glass baking dish. Put into oven. After 25 minutes, gently stir the potatoes, then return to over. Continue baking until the potatoes are tender (approximately an additional 20-30 minutes). Posted on April 30, 2017 April 29, 2017 by SherylPosted in FoodTagged potatoes, recipe. I love potatoes and this looks like a great way to treat them. Oh, those look delicious! I’m sure that aroma will remind me of my mom’s cornbread dressing that I absolutely LOVED. Thanks for sharing! You’re welcome. It’s a very nice recipe. This is amazingly like a roasted potato dish I make with fresh sage: coat an iron skillet with olive oil, layer fresh sage leaves, arrange halved small potatoes and chopped onion, and roast at 450 until done. I’m going to try this one, and see how it compares. I suspect the potato texture might be a little different. Who knows? It might be better! I suspect you’re right, because mine do come out very crispy. It will make an interesting comparison test. These look amazing! Definitely my kind of recipe. I’m curious to know what the water does? Does it keep the potatoes moist? Maybe that’s why my roasted potatoes are sometimes dry? Yes, these potatoes are moist – and don’t have a crispy coating. They have a nice texture. That looks like a good way to treat potatoes! I think I will try them with my cutlets today. And they were really good. Fitting for a Sunday dinner. The taste still lingers. I’m glad you liked them. Thanks for letting me know that you made them. It’s always nice to hear when someone finds a recipe I post interesting enough to actually make it. And, other readers find it really helpful to read about others’ experiences with a recipe. It looks delicious. I also love potatoes and can’t wait to try it. Oh I must try this one! It’s nice to hear that this post gave you a new idea. Sage works well with potatoes. Wow, not too shabby for a 100 year-old recipe! This would be great to try out with those little new potatoes. I had the same thought. I purchased some small potatoes to use in this recipe – but those tender small new potatoes would be divine. I’m planning to make it again when I have some new potatoes. Enjoy! I think that you’ll like this recipe. It’s easy to make and the potatoes are tasty. I think that you’ll enjoy Savory Potatoes. They’re tasty. My husband makes potatoes like this but with garlic and no sage. I like the idea of sage! Yummy! I never think to use sage. Onion, and garlic yes, but not sage! These would be great with eggs sunny-side up! They would be delightful with eggs. It’s nice to hear that the timing was perfect for this post. It’s a very nice recipe. They look delicious! And your serving bowl is lovely. Sheryl I am a fan of your posts. Loving all those old recipes. Most of them even older than my age😅. You are bringing out the real essence of cooking. Learning a lot from you. Thanks a lot. Thank you for the kind words. I have a lot of fun doing these posts, and it’s always wonderful to hear when someone enjoys them. I’ve never had powered sage. Is it different than dried sage? There are several different kinds of dried sage. Rubbed sage contains small dried pieces of leaves and stems. Powdered sage is a fine powder that I think is made by grinding the leaves. Interesting, thank you. The potatoes look tasty. This is one that I will definitely try! Just reading this made me want to make them. I think that you’ll enjoy them. They’re yummy.